In a small Georgia town, Mama Day, uses her gifts as a seer and healer, but her powers are ultimately tested when her beloved niece's life hangs in the balance. them for happiness. Love, family and tradition ruled their day. don't know how anyone can read this book and not love Mama Day and Abigail. if they are not, all the more kudos to their creator. 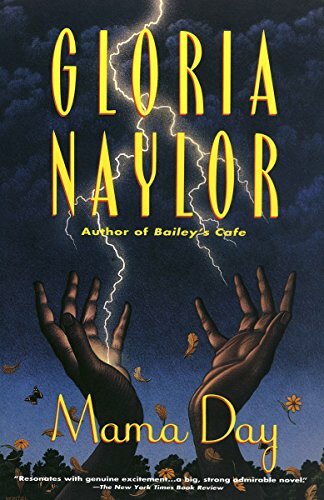 If someone, like David Wroblewski, wants to write a tragedy he should read a little Gloria Naylor to get some perspective on how it should be done. This is a powerful book with noble people - Mama Day, the matriarch we'd all want to turn to for strength, her loving sister Abigail, the fierce Cocoa, the proud and practical George. There's also a trifling worthless man, a colorful character and a mountainous example of wobbly malevolence. The people all interact in a beautiful nowhere island where time passes as it passes and nature, love and loss rule all. This is a story in parts - Mama Day strides across most of it like a colossus. I want to call her the matriarch, but she's not a mother. Perhaps the high priestess is a better description. Cocoa, her grand-niece, and George, Cocoa's husband who ultimately sacrifices himself to save Cocoa's life because he can't understand the world he is in. And that's the other part of this story. Mama Day lives in a world that we might call magical, although she denies she "does that Hoodoo nonsense." Cocoa crosses that world to the everyday world of job hunting, marriage, dinner parties and the like. George is firmly based in the mundane - he's an engineer who never has the grand idea, but takes the grand ideas of others and turns them into hard reality. An immensely moving book with so much to say on the meanings of love, fidelity, and strength. Multiple protagonists and narrators were woven together into one cohesive story that is truly compelling; I found myself stopping and rereading passages not because I didn't understand them the first time but because I wanted to savor the way that they made me feel. How can I go with you? she asked him. It's not often that you read a book that is magical and practical at the same time, but to me, Mama Day straddles both worlds. Set on an island that doesn't belong to South Carolina or Georgia, the story feels like it is set outside of time and space as well. I often think of this book, and the way Naylor says that every relationship has four sides-- his side, her side, the inside and the outside. In other words what he thinks, what she thinks, what people see, and what really happens. It's elegant in its simplicity. I enjoyed this book more than I thought I would. Although there is an element of mysticism that figures prominently in the story it is, at heart, about people and community - interesting characters who are quite different from one another yet all fit together beautifully in this work. It is sometimes a sad book in that bad things happen to good people yet, for me, that wasn’t as meaningful to the story as the comfort and joy in the strong relationships between the characters. I sometimes get irritated with books with multiple narrators and character’s points of view but I think it was pulled off very well here and I never felt confused or jolted by the switch between narrators. Naylor does a beautiful job bringing to life Willow Springs and it’s residents. Mama Day made me smile and laugh to myself so often I know she will stay in my thoughts for a long while. I didn’t even mind the characters that I personally found rather unlikeable, such as Cocoa, because they were so well fleshed out and vital to the story. Another strong book by Naylor. A city woman is still tied to her country roots, exemplified by the elder women who raised her. In another author, I would call this magical realism, but here it just seems like daily life. I'm still not sure I understood what Seraphina was all about...the distant past remains shrouded in mystery (or mystique). One of my favourite novels and the book that helped me discover the work of Gloria Naylor. The magical realism reminds one of the works of Isabel Allende. For fans of southern American literature, this is a must read.